Musical communities are interesting studies in human psychology. You find them in just about every population on Earth: groups of people who come together to shape an aural space with each other, either through song, dance, through the playing of melodies on instruments or rhythms on the drums, or a combination of all of the above. In my life I’ve had the pleasure of being involved in lots of musical get-togethers…and I mean lots. Be it a country/bluegrass pickin’ party in an old mill in rural Tennessee, late night Irish session at the Fleadh in Sligo, endless blues jam at a bar in Regensburg, Congolese dance session at a private party in a barn in rural Bavaria, Berber singing and dancing at a cafe in Fez, German folk songs in the mountains on the French border, slam poetry night at a university coffee shop in Western Kentucky, or the myriad other experiences I’ve had and situations I’ve found myself in, I’m always fascinated by the spirit that connects people when they sit down to make music together. The question I inevitably ask myself when I participate in or listen to a jam, session, Sitzweil, or whatever name it’s going by that evening, is “Why?” Why is this happening? Why are these people here? What brought them together? How did they start playing their instruments? Of course when there’s money or even free food involved it makes financial sense to play, but what about all of the people who are just there ‘for fun’? What does ‘for fun’ mean? One of my favorite parts of any jam is being able to talk to other musicians about why they’re there and to learn new things about people, and I guess in saying that I’ve brought you a little bit closer to what ‘for fun’ means to me. A big part of it is the people that I meet, and finding out how they got where they are. I’d like to take a second to tell you about my own musical journey from Western Kentucky to Regensburg, Germany, the city I’ve been living in for the last seven years, and tell you what my own “whys” have been over the years. I’d also like to tell you a little bit about the communities that I’ve met. Hopefully by the end I’ll be able to infect you with a little bit of this curiosity that has made my old-time experience so rewarding. BEFORE I MOVED to Regensburg, I lived in the small Western Kentucky town of Murray, and spent my childhood going back and forth between that small town and the even smaller small town of Cadiz on the other side of a state park. Before graduating high school, my only musical experiences had been that I had sung in my church as a kid and I had played the baritone for a year in sixth grade – because the band director convinced me that the instrument I had wanted to play, the flute, was a girl’s instrument. Imagine if I had picked up the flute in sixth grade instead – After a semester in the big city of Louisville right after high school, I moved back to Murray and saw my very first mandolin. Now, maybe I had seen mandolins before that, but I had never consciously thought about them as an instrument separate from a guitar. 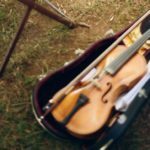 I fell in love with the instrument and started taking lessons from the first guy I saw playing one – a wicked mandolinist and guitarist who led the music team at my church. From the moment I got my first mandolin in my hands I was hooked, and it didn’t really leave my hands for at least two years. People at my university knew me as the ‘mandolin guy,’ and you can tell exactly when I started learning by looking on Facebook; all the pictures after a certain date are me with mandolin, and all the pictures before are without. Shortly after starting my career as a mandolinist (I think I was still working on Old Joe Clark and Salt Creek) I was ‘discovered’ by Tommy Ogle, an old-time clawhammer banjo player who went to my church. It must be noted that when Tommy came to me and told me in his thick Texas accent that he played ‘Old-Time Mountain Music’ and ‘clawhammer’ I had no idea what that was. I asked him if that was the same thing as bluegrass, and he just shook his head and said, “You got a lot to learn.” And I definitely did. I became his understudy, going with him to festivals and jams all over Tennessee and Kentucky, jamming with him at his house, and playing with him at parties and Revolutionary War reenactments. He never told me what I was ‘supposed to do,’ really, he would just call me up and say, ‘Hey Richard, I’m heading to *insert festival name here*, come on with me if you got time.’ And then I’d go, and I’d follow Tommy around from jam to jam with my mandolin, trying my best to play along to these melodies I had never heard before and meeting a lot of fun and interesting people. I was thrown off the dock into the deep end of the world of old-time music, and I found it fascinating. 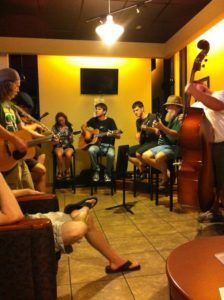 The music struck a chord with me, so to say, and I wanted find other people to play and share it with; so much so that I helped start a weekly jam at a coffee shop on my college campus that attracted a pretty nice cross section of musicians. 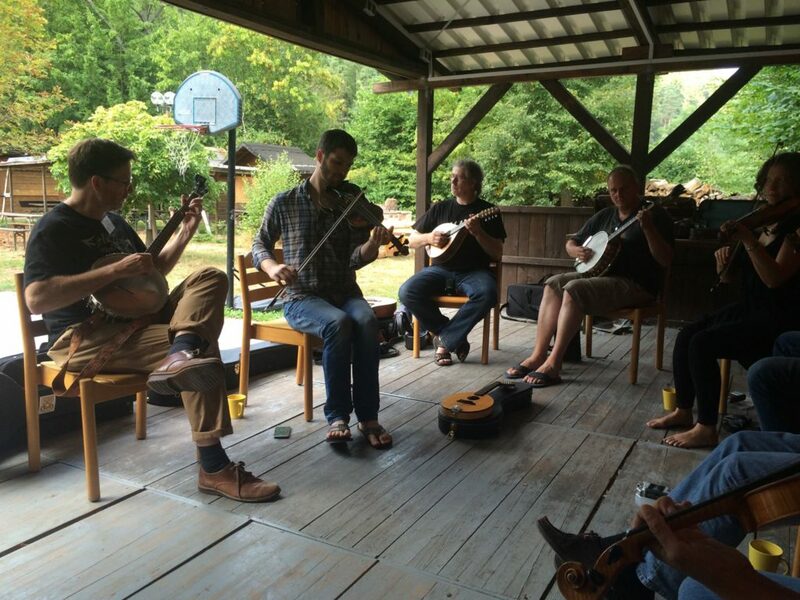 A few of us from this jam even started an old-time and bluegrass band. We traveled all over and played all sorts of gigs, from an excellent little old-time festival in Natchez, Mississippi to a radio show in Lexington, Kentucky. Jamming with the guys every Wednesday at the coffee shop, having band practices twice a week, and our pretty solid performance schedule only brought me even closer to the music. I felt like I had really found ‘my thing.’ If you had asked me at the time why I went to jams, or why the music was fun for me, I probably would have told you that I loved seeing myself and other people around me grow and develop musically. This was a real community experience. All the guys and gals at the coffee shop were coming in without much of an idea of what it meant to play music together and coming out with deep personal relationships and a sense of accomplishment that would have been pretty tough to replicate elsewhere. The personal fulfillment that came from these experiences became my primary “why” when it came to playing music. Looking back, I think that what I liked the most about my pre-Regensburg experience with folk music was precisely the fact that I didn’t really approach music with clear definitions. 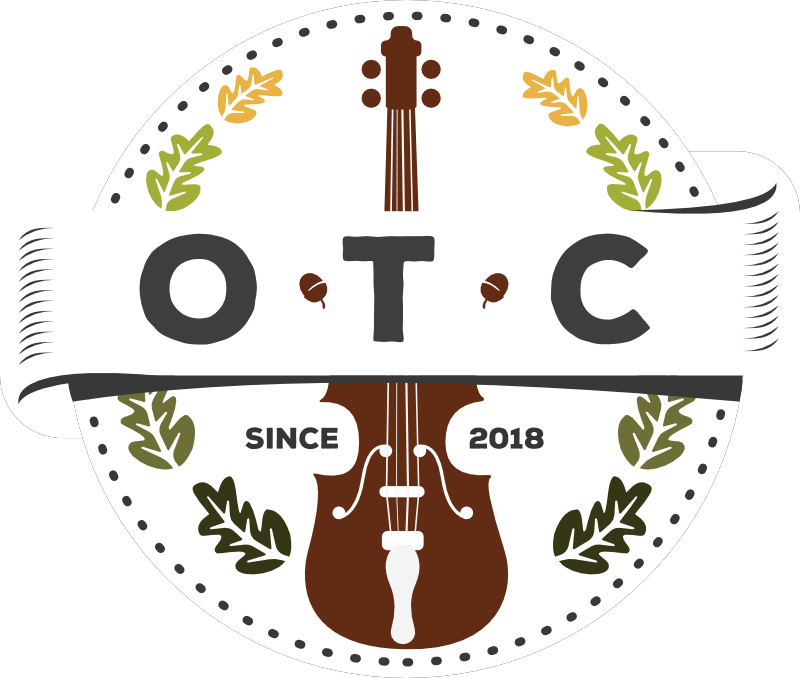 Playing old-time, bluegrass, country, and Irish music never seemed like separate things to me, and I wasn’t really sure where one stopped and the others started. It was a journey of discovery for me, and of course it was, because I didn’t know any better. I remember learning Irish tunes from Mel-Bay books with a friend who played Irish flute and bodhrán. I remember going to the mill in little Bumpus Mills, Tennessee, and playing with some of the most mind-blowing fiddlers I had ever heard. I guess they were playing a mixture of country, bluegrass, ragtime, and blues standards, but they never talked about it that way. They just played, and whatever came out, that’s what they played. If I played the Silver Spear or Cumberland Gap they never complained; they just played right along. At our coffee shop jam, guys with guitars would show up and start playing Dylan songs, and we had a great old time jamming on those too. Of course I eventually learned the difference, but I think it was critical in my formative phase that nobody told me what to play or what not to play. This feeling of openness and inclusiveness was, I think, the best takeaway that I had from my time as an undergraduate. MY LIFE DIDN’T STAY where it was, though. I had big plans and big dreams, and the biggest of them involved moving to Europe and getting my Master’s degree. Seeing as how I didn’t have a set plan for exactly where I wanted to go, in my last year of college I signed up for an exchange semester at the University of Regensburg in Bavaria as part of my German major. I fell in love with the city. Regensburg is a city that grew out of a Roman fort on the Danube, got rich off the salt trade in the Middle Ages and the Renaissance, built a lot of beautiful buildings, and then promptly went bust once the Bavarians built a canal around the town to divert the salt ships. The sudden disappearance of their cash cow meant they didn’t have the money to keep building new buildings, so they had to make due with the ones they had built back when they were on top of the heap. Regensburg rises out of the Danube as if out of a medieval storybook, but is also brimming with life thanks to the big companies with branches there and a university that attracts lots of young people. It’s been voted the ‘Singles Capital’ of Germany several years in a row. Needless to say, this was all a drastic change of scenery for a kid who grew up on a horse farm in Western Kentucky. During my exchange semester I met several great musicians and started a folk band called the Whisky Bandits, a project that ended up lasting several years. But I’m focusing on my old-time adventure, so I’ll just say that I was so charmed by the city that I couldn’t stay away. After finishing my degree program at Murray State, I enrolled in Regensburg’s Master’s program in history. In addition to my mandolin and an old guitar, I also took a fiddle with me. 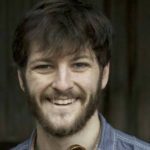 I knew I probably wouldn’t have much of an old-time community around me in Regensburg, and I wanted to have a way to keep doing ‘my thing.’ I had started on the mandolin, but I had always loved playing with fiddlers. The sound of the ‘devil’s box’ on old recordings had always mystified me, and I had always wanted to learn how to play it. This combination of my love for the traditional sound of the music and my own desire to take a piece of home with me led me to pack a fiddle along even though I hadn’t really played one before, and my many days spent alone in my bedroom scratching away on it were quite cathartic, especially when I was feeling homesick. I spent my first year in Regensburg doing about as well as you’d expect a poor farm boy from Western Kentucky to do. Having very few resources and no backing from home, I had to subsist by picking up odd jobs where I could and by playing street music. Luckily, Regensburg was a great city for that. I went to the very first Irish session in a medieval-themed pub in the city and met a fiddler named Sebastian who played a mean Scottish fiddle. The two of us became good friends, and we’d go out three days a week and chunk out sets from Alasdair Fraser’s albums and a few old-time songs, him on the fiddle and me on the guitar. It was a really great experience for me, both socially and musically, not to mention that the money from street music helped me to pay the rent and buy food again; I ended up losing about 25 pounds due to my extremely Spartan food rationing, so this was a definite plus. We eventually started a band in the city called Breaking Strings, because every time we went out to play street music I broke at least one guitar or mandolin string, and because we are obviously very creative. And we ended up getting really into the German Irish scene, which is surprisingly high quality, close-knit, and active. Several years passed this way. I took my studies at a pretty slow pace to maximize my time spent experiencing Europe. As a part of this experience I intentionally spent a lot of time with the Irish players, both in Germany and eventually in Ireland as well. I put a lot of energy into growing the Irish and Scottish scene in Regensburg. My Irish band kept touring for years all over the place, and we started a session in Regensburg which eventually grew to be one of the largest in Germany. Perhaps our crowning achievement was starting the Regensburg Celtic Folk Weekend, a weekend-long workshop event in town. Students came from all over the area to take classes in a high school in town, and the sessions afterwards were always killer. I think that, at that point in my musical development, what made the sessions fun for me was that sense of community. We spent a lot of time practicing Irish tunes together, and it was a real rush to be able to play them really fast for hours, one after the other, mostly mistake-free. It was also like a badge of honor to be able to walk into a session anywhere in Europe, sit down, and be able to play most of the tunes. Although it was a totally different experience from the jams back home, it was equally rewarding. 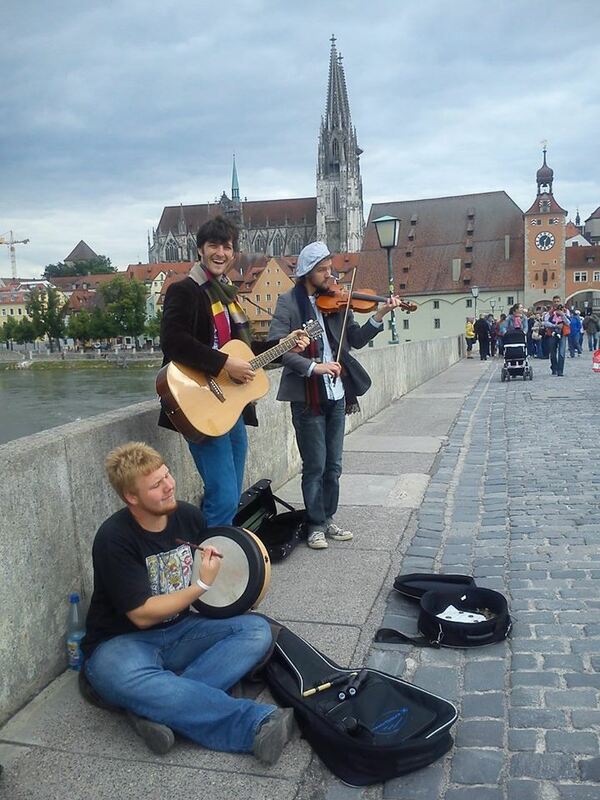 Watching the Irish and Scottish folk scene in Regensburg grow so quickly and organically was definitely a significant source of pride for me, and I was always especially impressed by my bandmates and how they grew over the years. The bodhrán player became one of the best players of his instrument that I’d ever heard in a very short time, and then he picked up the mandolin and got really good at that, too. Sebastian, the fiddler, started with J. Scott Skinner tunes, which turned out to be a gateway drug, since he then started learning exclusively out of books of old strathspeys from the 1700s. Our piper started studying uilleann pipes at the University of Limerick, spending literally every day piping with the greats. Everyone in the band was growing into ‘their thing,’ and finding the form of musical expression that best suited them. Meanwhile I was in my room by myself scratching away at the fiddle whenever I got a free afternoon and waiting to go to my yearly old-time outlet, the Appalachian String Band Festival in Clifftop, West Virginia. I was into the Irish music, and still am, but it didn’t speak to me the same way the music I had played back home had. 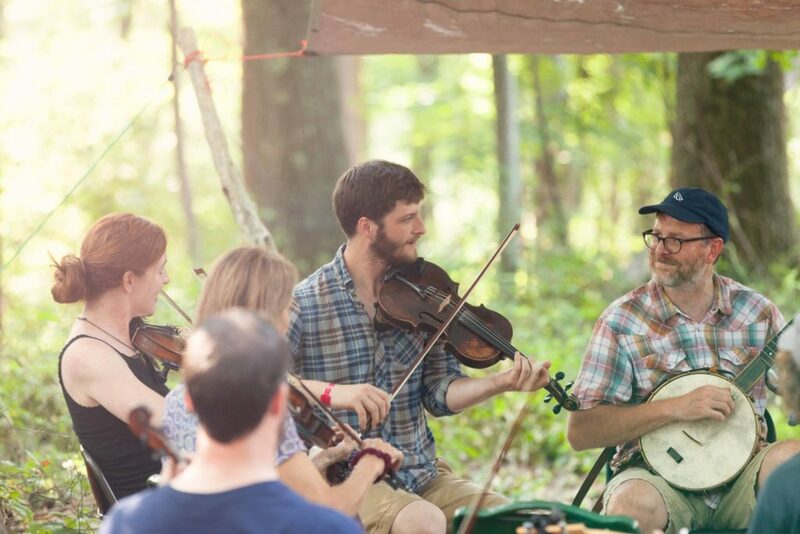 I decided that my years of being a lonesome fiddler had to end, and I set out to build an old-time community the same way we had built an Irish one. TRYING TO BRING OLD-TIME to Regensburg ended taking me down a path that actually started in the far away hills of the Palatinate. 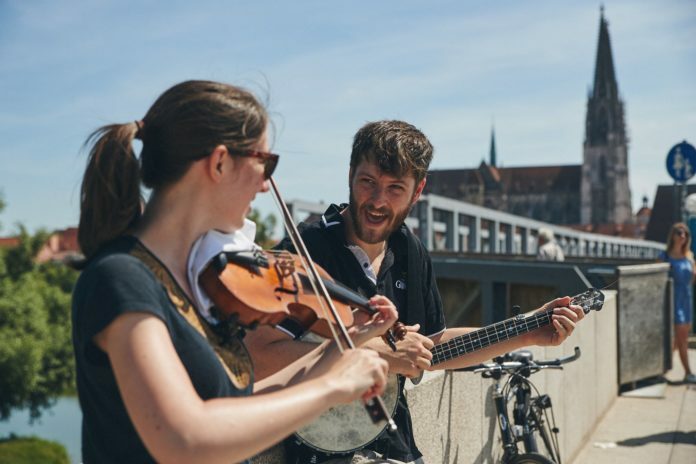 There was a non-profit in the town of Elmstein which organized world music workshops, and I thought that I could plug into their system and offer classes to attract people who might be interested in playing music with me. The organizer ended up giving me a shot, letting me plan a workshop for the summer of 2016. I planned an old-time band workshop, open to all instruments. It was a big endeavor and I wanted it to go off without a hitch, so I invited my friend Edwin, who I had known from my time spent going to festivals back in the US, to help me out. I had visited him a few times at his home in Jackson, Mississippi, and camped with him at Clifftop over the years. Edwin flew over to teach the banjo and guitar portion of the class while I taught the fiddles and mandolins. Originally I had been concerned that no one would sign up to play a type of music they had never heard of before, but we must have done something right, because we ended up with the biggest class at the event! I was just over the moon. It went so well, in fact, that Wulf offered to let us plan a whole weekend of old-time workshops the next year. Having another old-time outlet was a really great feeling for me, and I felt a connection to the music and a passion return to me that I hadn’t experienced in years. Some people had started playing old-time because they had heard it once in a movie and found it appealing. Some had made a lateral move from the well-established bluegrass scenes in cities like Munich. Some wanted to play a niche music in order to seem more interesting. Some had fallen in love with the banjo after hearing old Pete Seeger recordings. Others had bought Carter Family records as kids and had fond childhood memories of jamming along to them on their guitars. Every person’s approach to the music was different, as was every person’s reason for sitting at the jam. Some people wanted to show off, some people wanted to learn, some people wanted the community, some people just wanted to chat. I think that one of my favorite answers to the question ‘why’ came from an Irish piper named Dave, who I met in Nuremberg. Dave was sort of a spiritualist/Buddhist type who had spent his teenage years hitchhiking through the Middle East and India with just a backpack and his pipes, on sort of a pilgrimage to discover himself. He told me that he came to his local session every Tuesday and played the pipes as a form of meditation. How interesting is that? My travels to play music with communities all over Germany brought me into contact with tens and hundreds of people whose stories were just as riveting. Adrian and Renate ended up staying in Canada for a year before moving back to Regensburg. While they were in Canada, Renate had picked up playing an old tenor banjo I had sold to them – which they promptly put nylon strings on and tuned like a ukulele – and they had taken their banjo-bass-vocal harmonies gig on the road, playing country and gospel duets the whole year in Toronto and Montreal. By the time they had moved back to Regensburg, they had both been bitten by the American music bug, and I sealed the deal by bringing around friends of mine from the States who had flown over to teach with me at Elmstein. After a few late night old-time jams in his basement with us, Adrian was just as hooked as I was. TODAY, Regensburg is a city with a thriving folk community, and I’m really proud to have played a part in that. The Raintown Ramblers are alive and well, and we’re gigging in Bavaria wherever we can, be it clubs, bars, wild west reenactments- which I never knew were a thing – the bridge, and we’ve had many a late night jam in Adrian’s basement or in my living room. 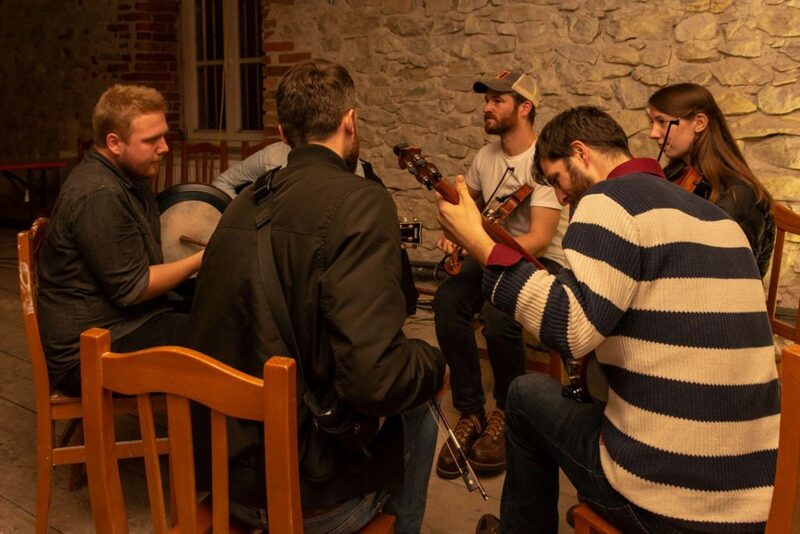 I’m still organizing workshops, from the occasional fiddle or banjo workshop here in Regensburg, usually attended by people from our booming Irish scene, to the big weekends in Elmstein that I’m happy to still be teaching at. Musically I’m right where I want to be. But life is always in motion. Things are changing for me again. My Master’s studies have been behind me for over a year now, and Caitlin and I have decided to move to Charlotte, North Carolina in January. We’re pretty excited about the move. I’m especially about excited about the new musical communities and weird characters I’ll meet. I’ll hopefully be able to find a way to use my love of the music and my passion for organizing events that bring people together to keep my musical journey as interesting as it’s been for the last few years. Still, the thought of leaving Regensburg is bittersweet for me. It was in this old medieval city that a poor farm boy from Kentucky went from playing street music to be able to afford to eat once a day to organizing events and gigging around Europe with old-time and Irish bands. I’ll miss the basement jams, playing on the bridge, and teaching banjo workshops. I’ll miss Sebastian and his strathspeys from the 1700s, Renate and her tenor banjo with the nylon strings, and shouting the lyrics to Big-Eyed Rabbit with Adrian at whisky tastings. But Regensburg has been around a long time. Since the Romans, actually. And it’ll be around long after this farm boy is gone. I think, though, that a few of the seeds I’ve planted here will continue to grow, and that the community will only get stronger as time goes on. The thing I love the most about playing music together with people are the people themselves. Without exception, everyone who finds themselves drawn to this music has their own weird and wonderful story. Getting to know these people and their stories is one of my greatest joys in life, and it makes going to new jams and meeting new people really fun for me. I hope that you’ve enjoyed reading a bit of my story and hearing about some of the places I’ve been and people I’ve met through old-time music. And if you have enjoyed it, then what are you doing still reading this? Grab an instrument and go find some musical communities of your own to get to know and make music with. You won’t be disappointed. Richard Osban is the assistant editor of Oldtime Central. He is a musician, writer, and oral historian in Charlotte, North Carolina. Great read, best of luck on your next chapter! It’s an interesting discussion of people’s motivations to play music, thanks for sharing your thoughts on this!